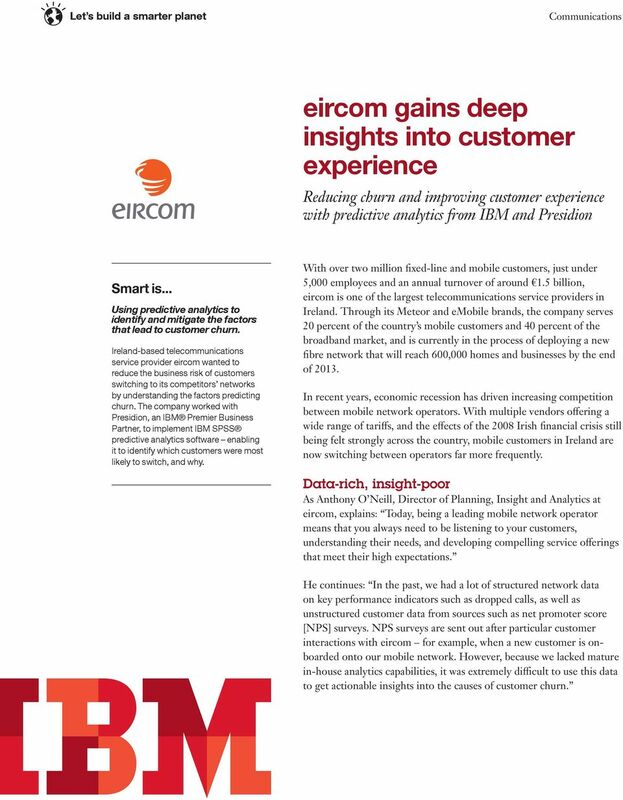 Download "eircom gains deep insights into customer experience"
1 eircom gains deep insights into customer experience Reducing churn and improving customer experience with predictive analytics from IBM and Presidion Smart is... Using predictive analytics to identify and mitigate the factors that lead to customer churn. Ireland-based telecommunications service provider eircom wanted to reduce the business risk of customers switching to its competitors networks by understanding the factors predicting churn. 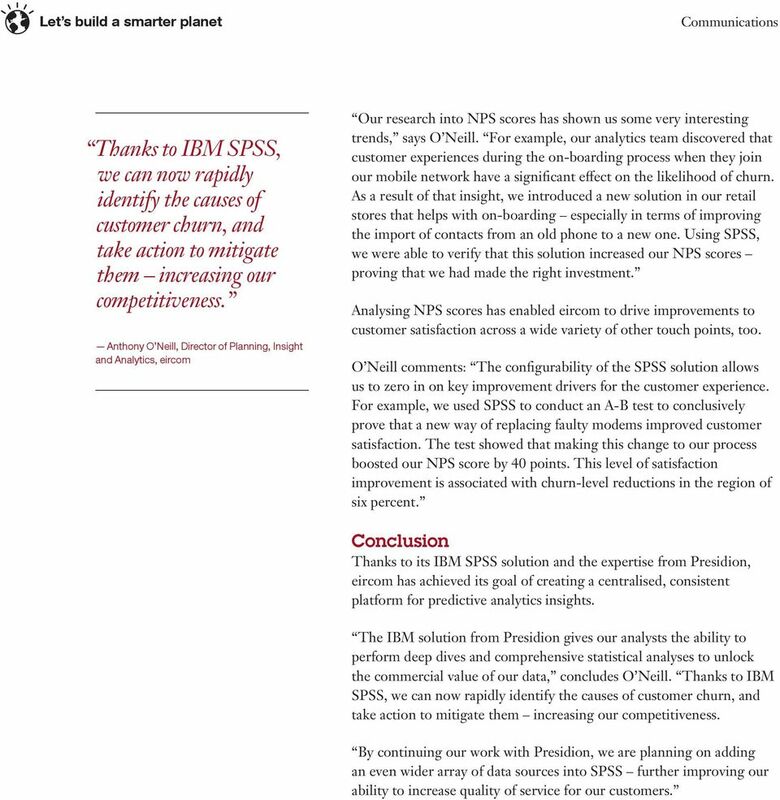 The company worked with Presidion, an IBM Premier Business Partner, to implement IBM SPSS predictive analytics software enabling it to identify which customers were most likely to switch, and why. With over two million fixed-line and mobile customers, just under 5,000 employees and an annual turnover of around 1.5 billion, eircom is one of the largest telecommunications service providers in Ireland. Through its Meteor and emobile brands, the company serves 20 percent of the country s mobile customers and 40 percent of the broadband market, and is currently in the process of deploying a new fibre network that will reach 600,000 homes and businesses by the end of In recent years, economic recession has driven increasing competition between mobile network operators. With multiple vendors offering a wide range of tariffs, and the effects of the 2008 Irish financial crisis still being felt strongly across the country, mobile customers in Ireland are now switching between operators far more frequently. Data-rich, insight-poor As Anthony O Neill, Director of Planning, Insight and Analytics at eircom, explains: Today, being a leading mobile network operator means that you always need to be listening to your customers, understanding their needs, and developing compelling service offerings that meet their high expectations. He continues: In the past, we had a lot of structured network data on key performance indicators such as dropped calls, as well as unstructured customer data from sources such as net promoter score [NPS] surveys. NPS surveys are sent out after particular customer interactions with eircom for example, when a new customer is onboarded onto our mobile network. However, because we lacked mature in-house analytics capabilities, it was extremely difficult to use this data to get actionable insights into the causes of customer churn. 2 Business benefits Facilitates inter-departmental cooperation between analysts of all levels enhancing understanding of churn. Reduces the time required to process data by 75 percent through automation. Enables eircom to identify the most effective ways to improve the customer experience reducing churn on key customer journeys by around six percent. To understand the factors that lead to customer churn and develop strategies to reduce it, eircom realised that it needed to develop a centralised, consistent approach to analytics within the business. Previously, we used outsourced services to perform our churn modelling, which involved a formal change-request process every time we wanted to update the churn models, says O Neill. In addition to reducing our flexibility around analytics, this approach meant that we were unable to react quickly to changes in the market increasing the business risk of losing customers to our competitors. 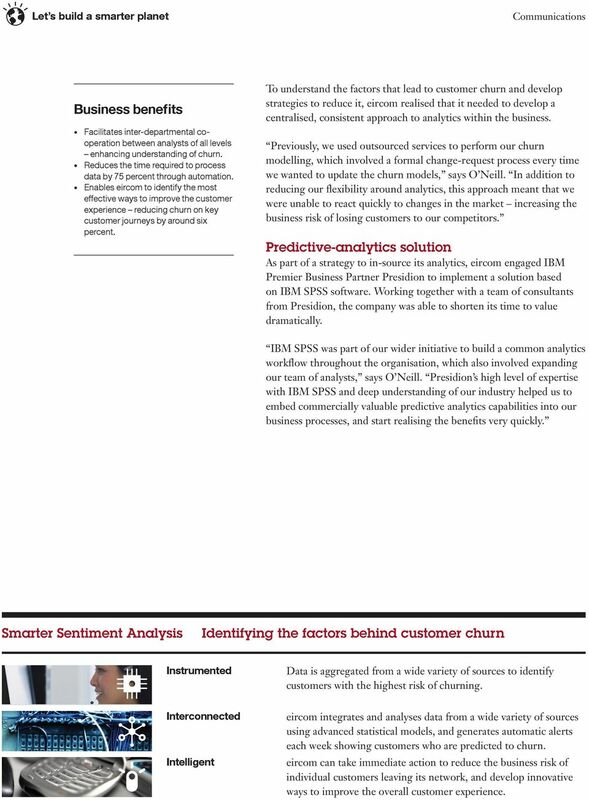 Predictive-analytics solution As part of a strategy to in-source its analytics, eircom engaged IBM Premier Business Partner Presidion to implement a solution based on IBM SPSS software. Working together with a team of consultants from Presidion, the company was able to shorten its time to value dramatically. IBM SPSS was part of our wider initiative to build a common analytics workflow throughout the organisation, which also involved expanding our team of analysts, says O Neill. 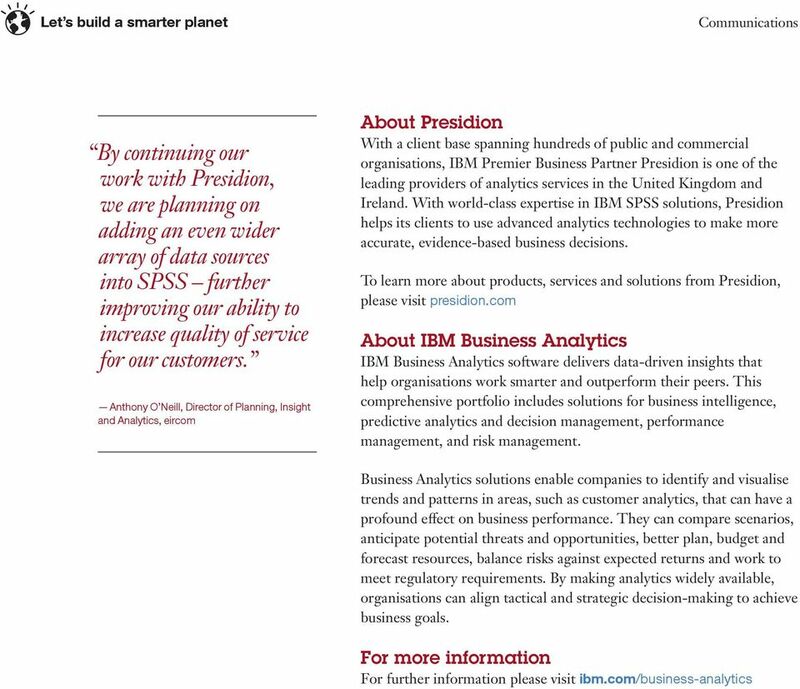 Presidion s high level of expertise with IBM SPSS and deep understanding of our industry helped us to embed commercially valuable predictive analytics capabilities into our business processes, and start realising the benefits very quickly. Smarter Sentiment Analysis Identifying the factors behind customer churn Instrumented Data is aggregated from a wide variety of sources to identify customers with the highest risk of churning. Interconnected Intelligent eircom integrates and analyses data from a wide variety of sources using advanced statistical models, and generates automatic alerts each week showing customers who are predicted to churn. eircom can take immediate action to reduce the business risk of individual customers leaving its network, and develop innovative ways to improve the overall customer experience. 3 Solution components Software IBM SPSS Modeler IBM SPSS Collaboration & Deployment Services IBM Business Partner Presidion Using SPSS Collaboration and Deployment Services has enabled us to automate a lot of repeatable tasks. By reducing the manual effort involved in certain aspects of the analytics process, we now spend 80 percent of our time thinking about and developing our analyses and only 20 percent of our time processing it rather than the other way around. Anthony O Neill, Director of Planning, Insight and Analytics, eircom Today, eircom uses a central instance of IBM SPSS to provide a consistent environment for building, storing, and refining its churn models. Using the versatile, intuitive platform, junior analysts can get started quickly with minimal training, and expert users can perform advanced analyses. Because there is now a consistent approach to analytics across the business, it s easy for our analysts in different departments to collaborate enhancing our understanding of the factors behind churn, says O Neill. Furthermore, using SPSS Collaboration and Deployment Services has enabled us to automate a lot of repeatable tasks. By reducing the manual effort involved in certain aspects of the analytics process, we now spend 80 percent of our time thinking about and developing our analyses and only 20 percent of our time processing it rather than the other way around. Deeper insights, lower churn Since implementing its IBM SPSS analytics solution, eircom has successfully in-sourced its churn modelling. With a dedicated predictive analytics team working in-house, the company can now run weekly churn models deepening its understanding of the way various factors combine to increase the likelihood of customer churn. For the first time, we can do text mining to examine unstructured data, which is especially useful in the case of free text fields in our NPS surveys, says O Neill. Text analytics help to understand customer sentiment at different points along their journey, and reasons why NPS scores are high or low for particular customers. Increasing competitiveness Today, eircom uses automated churn prediction alerts to enable the business to react quickly when an analytics model predicts that a customer s patterns of behaviour indicate a high probability of churn. Currently, the company s campaign management system is triggering multiple alerts each week based on insights from SPSS helping eircom to take immediate action to reduce the business risk of its customers switching to a competitor s network. 4 Thanks to IBM SPSS, we can now rapidly identify the causes of customer churn, and take action to mitigate them increasing our competitiveness. Anthony O Neill, Director of Planning, Insight and Analytics, eircom Our research into NPS scores has shown us some very interesting trends, says O Neill. For example, our analytics team discovered that customer experiences during the on-boarding process when they join our mobile network have a significant effect on the likelihood of churn. As a result of that insight, we introduced a new solution in our retail stores that helps with on-boarding especially in terms of improving the import of contacts from an old phone to a new one. Using SPSS, we were able to verify that this solution increased our NPS scores proving that we had made the right investment. Analysing NPS scores has enabled eircom to drive improvements to customer satisfaction across a wide variety of other touch points, too. 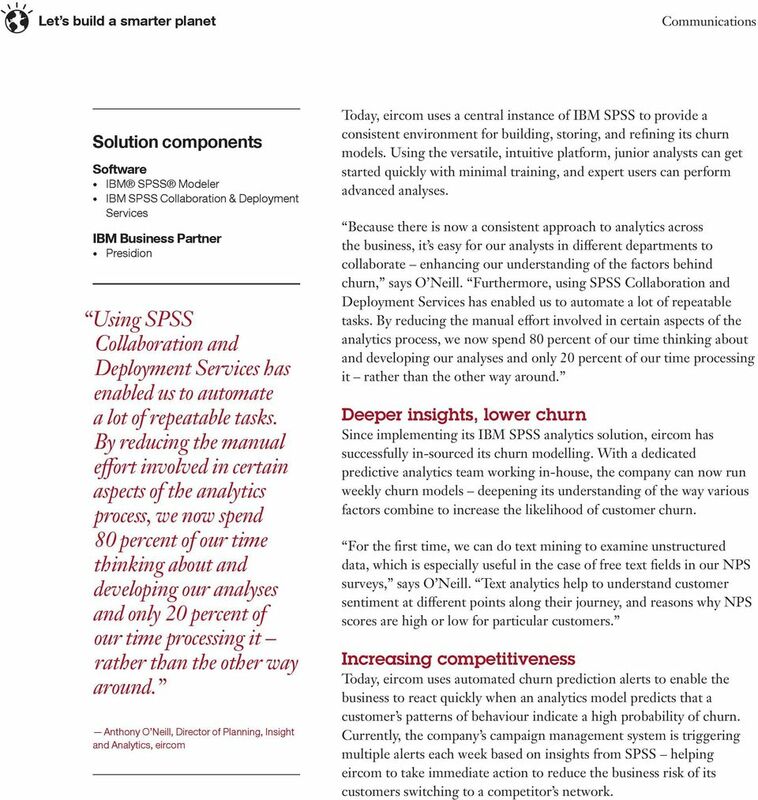 O Neill comments: The configurability of the SPSS solution allows us to zero in on key improvement drivers for the customer experience. For example, we used SPSS to conduct an A-B test to conclusively prove that a new way of replacing faulty modems improved customer satisfaction. The test showed that making this change to our process boosted our NPS score by 40 points. This level of satisfaction improvement is associated with churn-level reductions in the region of six percent. Conclusion Thanks to its IBM SPSS solution and the expertise from Presidion, eircom has achieved its goal of creating a centralised, consistent platform for predictive analytics insights. The IBM solution from Presidion gives our analysts the ability to perform deep dives and comprehensive statistical analyses to unlock the commercial value of our data, concludes O Neill. Thanks to IBM SPSS, we can now rapidly identify the causes of customer churn, and take action to mitigate them increasing our competitiveness. By continuing our work with Presidion, we are planning on adding an even wider array of data sources into SPSS further improving our ability to increase quality of service for our customers. U.S. Retail Report 2014 IBM DIGITAL ANALYTICS BENCHMARK 2 Summary Heading back to work, consumers clicked their way to the best deals on which remained the busiest online shopping day of the holiday season.